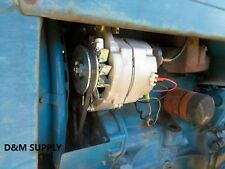 Alternator kit for Ford Tractors with tach drive mounted on the back of the alternator. Includes Alternator, Mounting hardware and wiring harness. Ford/New Holland - 2000 Series 3 Cyl 65-74, 3000, 4000 Series 3 Cyl 65-74, 5000, 7000. 1 single can of king kutter yellow. 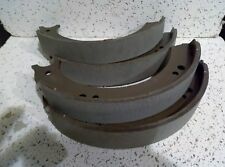 Set of 4 New Brake Shoes for 2N, 9N models. OEM part# 9N2019. We have over 30 years experience in agriculture. 1 can of oliver clover white 57-74 spray paint. We have over 30 years experience in agriculture. Ford/New Holland - 2000, 2110, 2120 COMPACT TRACTOR, 2150, 2300, 2310, 3000, 3055, 3110, 3120, 3150, 3300, 3310, 3330, 3400, 3500, 3550 INDUST/CONST, 4100, 4110, 4140, 4190, 4200, 4330, 4340, 4400, 4410, 4500 INDUST/CONST, 5000, 5200, 5340, 7000, 7200. For diesel applications only greater than 8/1981 545, 545A 545C 545D 555A 555B. 550 555 Gas or Diesel. We will work for you to get what you need. 1 single can of JCB yellow. We have over 30 years experience in agriculture. 2 cans of aluminum rim spray paint. popular with Massey Ferguson, IH Farmall, Ford, Case, International. Air Filter Ford/New Holland - 86512886, E9NN9601CA, SBA314531123. Hydraulic Filter Ford/New Holland - 9846407, SBA340500380, SBA340500610. Ford/New Holland - 86546623. Fuel Filter - SBA360720020. OIl Filter. 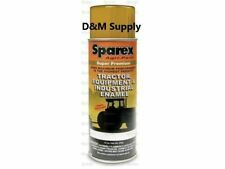 Ford/New Holland - 1801 INDUST/CONST, 1811 INDUST/CONST, 1821 INDUST/CONST, 1841 INDUST/CONST, 1871 INDUST/CONST, 2000 4 CYL 62-64, 4000 4 CYL 62-64, 4040, 4110, 4120, 4130, 5010S, 541, 600, 621, 631, 640, 641, 650, 651, 660 ROUND BALER, 661, 700, 740 INDUST/CONST, 741, 771, 800, 8030, 811, 820, 821, 840, 841, 850, 851, 860, 871, 900, 941, 950, 951, 971 COMBINE, 981. Ford/New Holland - Jubilee, NAA. Coil, Cable, Harness. We have over 30 years experience in agriculture. 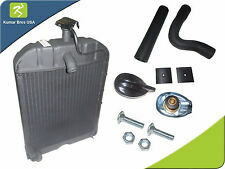 New Water pump kit for Ford tractors. We have over 30 years experience in agriculture. 2 cans of Oliver clover white 57-74 spray paint. We have over 30 years experience in agriculture. Ford tractor decal set with caution and turbo decals. We have over 30 years experience in agriculture. Ford/New Holland - 3830, 4010S, 4030, 5010S, 7530, TN55, TN55D, TN55S, TN65, TN65D, TN65F, TN65S, TN70, TN70D, TN70S, TN75, TN75D, TN75F, TN75S, TN90F, TT55, TT65, TT75. Ford/New Holland - 5108205. We have over 30 years experience in agriculture. Kubota - 59700-26112, 59700-26116. AF2300 - Air Filter. Air Filter. Inside Diam. : 3-9/16 (90.5), Outside Diam. : 6-1/2 (165.1), Length: 14. MCCORMICK - C100, C70, C80 W/PERKINS 1004-40T TURBO ENG, C90, CX100, CX105, CX70, CX75, CX80, CX85, CX90, CX95, F100, F100GE, F100XL, F105F W/1104C-44T ENG, F105F W/1104D-44T ENG, F105GE, F105XL W/1104C-44T ENG, F105XL W/1104D-44T ENG, F90, F90GE, F90XL, MC100, MC105, MC80, MC90, MC95. Ford/New Holland - E7NN11654AA. Light switch for diesel and gas applications. We have over 30 years experience in agriculture. We will work for you to get what you need. New Water pump for Ford oem #SBA145016191. We have over 30 years experience in agriculture. For diesel applications only. We will work for you to get what you need. For Diesel Applications. Note - Air filter is 15.3125" x 6.6875" and Hydro filter is 7.25" x 4.50". We have over 30 years experience in agriculture. We will work for you to get what you need. Massey Ferguson - 3618662-M2, 3618662M1, 3618662M2, 3902287M1. Agco - 3618662M1, 3618662M2. Challenger - 3618662M1, 3618662M2. White - 3902287M1. Hydraulic and Oil Filter. HF4434 - Lube Filter. White - 6124, 6144. 2 cans of Massey Ferguson Red 1961 and on. OIl Filter Ford/New Holland - 86546612, E1NN6714AB. Air Filter Ford/New Holland - 86512886, E9NN9601CA, SBA314531123. Fuel Filter - SBA360720020. We have over 30 years of experience in agriculture. Fits 1110, 1300, 1510 that use the oem Part#s below. We will work for you to get what you need. Local pickup is not available. Landini5830, 7830. Ford / New Holland2N, 9N. 1 rubber boot to fit the following. Pistons, rings or liners ordered without the overhaul kit are not warranted since we cannot be assured of the quality of your other components. Ford/New Holland - 85646605, 86546605, 86546605DS, APN6731B. Ford/New Holland - 2N, 340, 8N, 9N. Fleetguard - LF3364, LF574. Fiat - 211RB, 25C, 25R, 30CA, 311C, 311R, 311T, 312, 312R, 40CA, 40CV, 411C, 411C1, 411R, 411RB, 411T, 415, 415R, 421R, 431R, 451C, BI20 Lift Truck, BI25 Lift Truck, BIM20 Lift Truck, BIM25 Lift Truck, BM12 Lift Truck, BM15 Lift Truck, BM20 Lift Truck, BM25 Lift Truck. Coil, Cable, Harness. We have over 30 years experience in agriculture. Ford/New Holland - 231, 233, 2600, 2600V, 333, 335, 3600, 3600V, 3900, 4600, 4600SU, 515 Indust/Const, 531, 5600, 6600, 7600. Ford/New Holland - 5700, 6700, 6710, 7700, 7710. 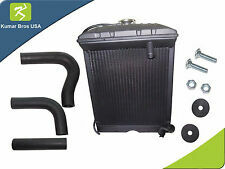 New Radiator Hose with wire core for the Following Models. Lower Hose, 1.75" ID. We have over 30 years experience in agriculture. Ford/New Holland - D1NN9R500A, E0NN9R500AA. AF2013 - Air Filter. Air Filter. 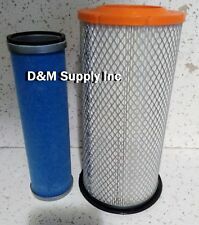 Air filter for diesel and gas applications. Inside Diam. : 1/2 (12.7), Outside Diam. : 3-5/8 (92.1), Length: 13-7/8 (352.4). Ford/New Holland - 5640, 6640, 6640S, 6640SL, 6640SLE, 7010, 7740, 7740SL, 7740SLE, 7840, 7840S, 7840SL, 7840SLE, 8010, 8160, 8240, 8240S, 8240SL, 8240SLE, 8260, 8340, 8340SL, 8340SLE, 8360, 8560, T6010, T6020, TB100, TB110, TB120, TM115, TM120, TM125, TM130, TM135, TM140, TM150, TM155, TM165, TS100, TS100A, TS110, TS110A, TS115A, TS125A, TS130A, TS90. 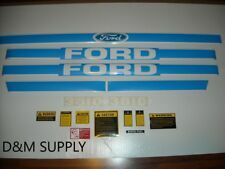 Ford tractor decal set with caution kit and shifter labels. We have over 30 years experience in agriculture. 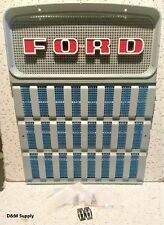 Ford 4000 decal set. We have over 30 years experience in agriculture. Ford/New Holland - C5NE9350A, D5NN9350B, F2NN9350AA. Ford/New Holland - 2000, 2150, 2300, 231, 2310, 233, 2600, 3000, 3055, 3110, 3120, 3150, 3190, 3300, 3310, 333, 3330, 335, 3400, 3500, 3550 Indust/Const, 3600, 3600V, 4110, 4140, 4190, 420 Indust/Const, 4330, 4340, 4400, 4410, 4500 Indust/Const, 4600, 4600SU, 5000, 515 Indust/Const, 5190, 531, 5340, 535 Indust/Const, 550 Indust/Const, 5500 Indust/Const, 555 Indust/Const, 5550 Indust/Const, 6600. Ford/New Holland - 84475542, 87415600, SBA140517020. Case/International Harvester - 84475542, 86402050, 87409203, SBA140517020. Hydraulic and Oil Filter. HF3611 - Lube Filter. Outside Diam. : 3 (76.2), Length: 3-17/32 (89.7), Thread: 3/4 x 16 UNF, Features: anti-drip valve, by-pass valve. Ford/New Holland - TM120, TM130, TM140, TM155, TM175, TM190, TS110. Ford/New Holland - 47128151, 5196842, 81868102, 82014790, 82034660, 87385322, 87603874.